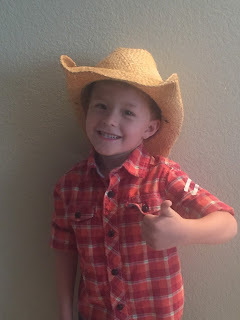 Cole had a Fall Festival at school last week so they were asked to dress up as Cowboys & Cowgirls. I remembered this last minute so this was the best I could come up with. He wore the hat all the way to the classroom door until he realize none of the other boys were dressed up and only 5 girls were. So off came the hat to be stored in his cubby. :*( Oh well at least I got a few good shots of my cute little cowboy!! They had a petting zoo and pumpkin decorating so he was pretty excited! Mommy take my picture by the spiderwebs. This little cowboy wanted to be just like his big brother! Mommy I want to take a picture of you with me. Daddy wants to be a Cowboy too! !